, an eminent naval historian, was descended from an ancient family at Eyton or Yetton, in Herefordshire, and born about 1553. He was trained up at Westminster school; and, in 1570, removed to Christ church college in Oxford. 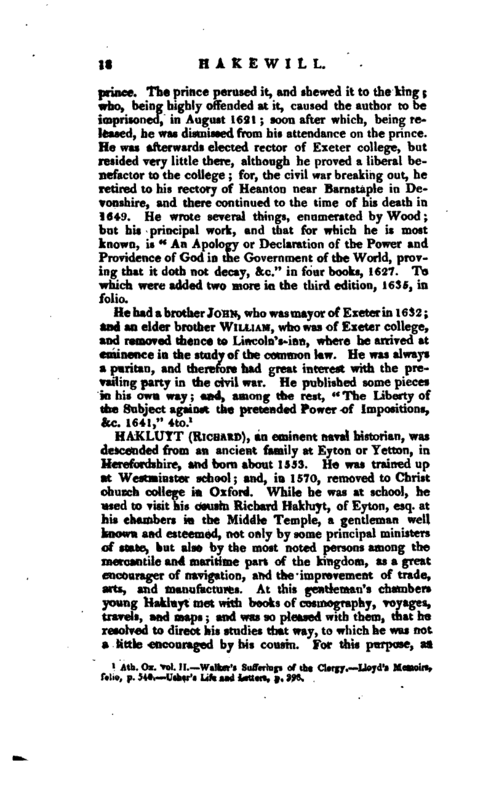 While he was at school, he used to visit his cousin Richard Hakluyt, of Eyton, esq. at his chambers in the Middle Temple, a gentleman well known and esteemed, not only by some principal ministers of state, but also by the most noted persons among the mercantile and maritime part of the kingdom, as a great encourager of navigation, and the improvement of trade, arts, and manufactures. At this gentleman’s chambers young Hakluyt met with books or' cosmography, voyages, travels, and maps; and was so pleased with them, that he resolved to direct his studies that way, to which he was not a little encouraged by his cousin. For this purpose, as | soon as he got to Oxford, he made himself master of the modern as well as ancient languages; and then read over whatever printed or written discourses of voyages and discoveries, naval enterprizes, and adventures of all kinds, he found either extant in Greek^ Latin, Italian, Spanish, Portuguese, French, or English. By such means he became so conspicuous in this new branch of science, that he was chosen to read public lectures on naval matters at Oxford, and was the first who introduced maps, globes, spheres, and other instruments of the art, into the common schools. The: zeal and knowledge he displayed made him acquainted with and respected by the principal sea-commanders, merchants, and manners of our nation; and^ though it was but a few years after that he went beyond sea, yet his fame travelled thither long before him. He held a correspondence with the learned in these matters abroad, as with Ortelius, the king of Spain’s cosmographer, Mercator, &c.
In 1582, he published a small “Collection of Voyages and Discoveries;” in the epistle dedicatory of which to Mr. Philip Sidney it appears, that his lecture upon navigation above mentioned was so well approved of by sir Francis Drake, that the latter made some proposals to continue and establish it in Oxford. The same year, he was much encouraged by secretary Walsingham to pursue the study of cosmography, and to persevere in the same commendable collections and communications. The secretary also gave him a commission to confer with the mayor and merchants of Bristol, upon the naval expedition they were undertaking to Newfoundland; and incited him to impart to them such intelligence as he should think useful. Hakluyt readily complied, and in acknowledgment of the services he had done them, the secretary sent him a very polite letter, which is printed in the third volume of his voyages in folio. About 1584, he attended sir Edward Stafford as his chaplain, when that gentleman went over ambassador to France; and continued there some years with him, and during his absence, being then master of arts and in order^ he was made a prebendary of Bristol. While at Paris, he contracted an acquaintance with all the eminent mathematicians, cosmographers, and other persons of a similar taste with himself. He inquired after every thing that had any relation to our English discoveries; and prevailed with some to search their libraries for the same. At last, | having met with a narrative in ms. containing “The notable History of Florida,” which had been discovered about twenty years before by captain Loudonniere and other French adventurers, he procured the publication of it at Paris at his own expence in 1586; and in May 1587, he published an English translation of it, which he dedicated after the example of the French editor, to sir Walter Raleigh. The same year he published a new edition of Peter Martyr’s book, entitled “De Orbe Novo,” illustrated with marginal notes, a commodious index, a map of New England and America, and a copious dedication, also, to sir Walter Raleigh; and this book he afterwards caused to be translated into English. Hakluyt returned to England in the memorable year 1588, and applied himself to methodize the naval history of England more accurately and more extensively than had ever yet been attempted, in which he was, as usual, encouraged by sir Walter Raleigh. He applied himself also to collect, translate, and digest, all voyages, journals, narratives, patents, letters, instructions, &c. relating to the English navigations, which he could procure either in print or ms.; and towards the end of 1589 he published these collections in one volume folio, with a dedication to sir Francis Walsingham, who was a principal patron and promoter of the work. About 1594 he entered into the state of matrimony, which did not divert him from going on with his collections of English voyages, till he had increased them to three volumes folio: and, as he was perpetually employed himself, he did not cease to invite others to the same useful labours. 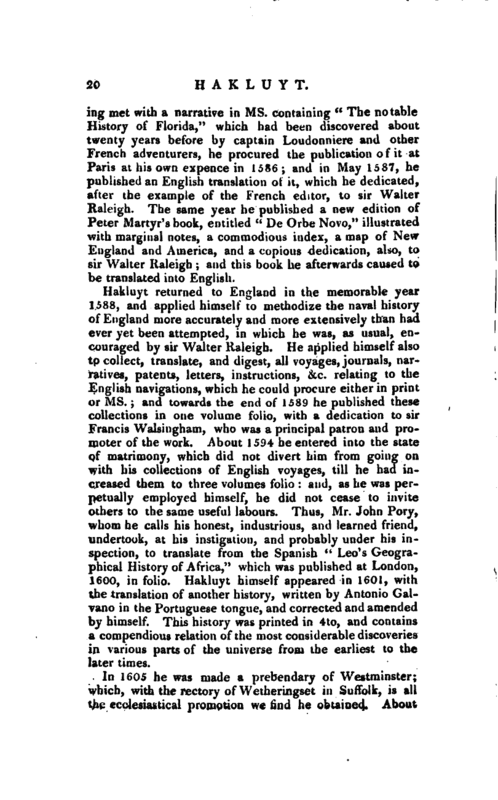 Thus, Mr. John Pory, whom he calls his honest, industrious, and learned friend, undertook, at his instigation, and probably under his inspection, to translate from the Spanish “Leo’s Geographical History of Africa,” which was published at London, 1600, in folio. Hakluyt himself appeared in 1601, with the translation of another history, written by Antonio Galvano in the Portuguese tongue, and corrected and amended by himself. This history was printed in 4to, and contains a compendious relation of the most considerable discoveries in various parts of the universe from the earliest to the later times. In 1605 he was made a prebendary of Westminster; which, with the rectory of Wetheringset in Suffolk, is all the ecclesiastical promotion we find he obtained. About | this time the translation of Peter Martyr’s “History of the West Indies” was undertaken, and first published by Mr. Lock, at the request and encouragement of our, author: for, besides his own publications of naval history, far superior to any thing of the like kind that had ever appeared in this kingdom, he was no less active in encouraging others to translate and familiarize among us the conquests and discoveries of foreign adventurers. This, and the spirit with which he also animated those of his countrymen who were engaged in naval eriterprizes, by his useful communications, gained the highest esteem and honour to his name and memory, from mariners of all ranks, in the most distant nations no less than his own. Of this there are several instances; and particularly in those northern discoveries made at the charges of the Muscovy merchants in 1608, under captain W. Hudson: when among other places there denominated, on the continent of Greenland, which were formerly discovered, they distinguished an eminent promontory, lying in 80 degrees northward, by the name of Hakluyt’s Headland. 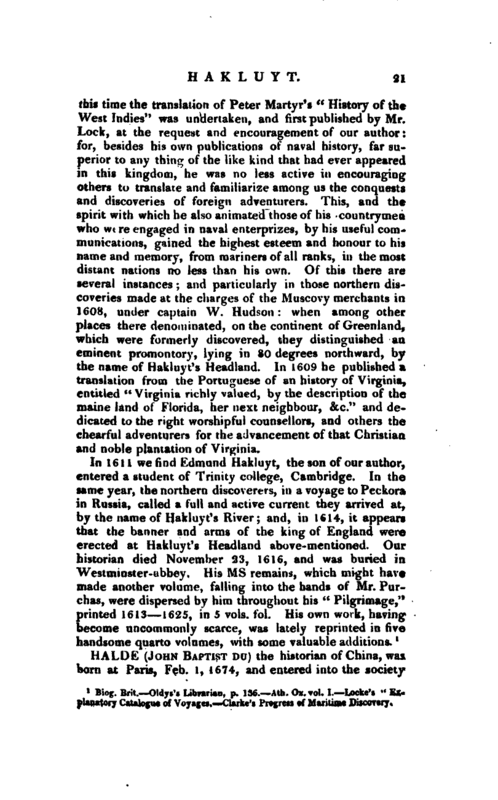 In 1609 he published a translation from the Portuguese of an history of Virginia, entitled “Virginia richly valued, by the description of the rpaine land of Florida, her next neighbour, &c.” and dedicated to the right worshipful counsellors, and others the chearful adventurers for the advancement of that Christian and noble plantation of Virginia. 1 Biog. Brit. 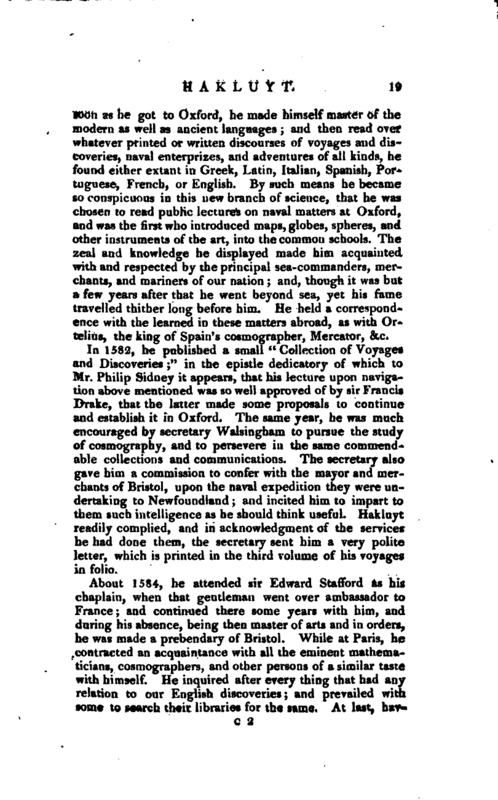 Oldys’s Librarian, p. 136. —Ath. Ox. vol. L Locke’s " Ex flapatory Catalogue of Voyages, Clarke’s Progress of Maritime Discovery.